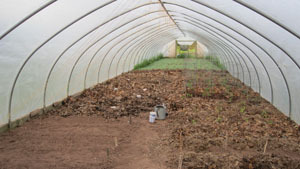 In our decades of gardening life, we’ve never had any extra mulch to spare for the garden. It has been a scramble to feed the maw of our compost drum over the years, with none left over for piling between the vegetable rows to keep the weeds down and the moisture in. That is until this year. One of our good gardening buddies told us about the City of Hancock, and their technique for accumulating lawn waste. You can drop your stuff off for free if it is in a biodegradable bag. And they encourage people from the community to drive back to the leaf pile and help themselves. Well, on several of my trips to town, I’ve done just that, and have accumulated leaves and grass clippings to spare. So this year for the first time we’ve been able to do our planting and then mulch around the plants. Everything looks so much neater in the gardens now, and when I move the mulch aside, I see moist earth below. One thing I’ve found interesting when I open the bags of yard waste and spread it out, is the diversity of environments the leaves come from. I’ll get a run of pine needles (which I save for the blueberries,) then some maple leaves, and even one bag containing a fair number of chestnuts. 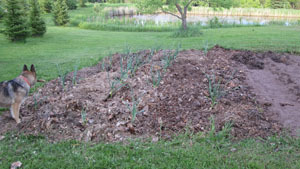 Now the compost tumbler is full of good stuff for the gardens, and the ever spreading area of mulch is blanketing this year’s crop, which will be rototilled in for next year’s crops as well. The only downside so far is the rose bush prunings. My habit in the summer is to go BAREFOOT. My feet, tough as they are, found some wicked rose bush prunings in one of the rows. It found them because they impaled themselves into my feet. I walked gingerly down that row for a while, I can tell you. This entry was posted on Sunday, June 16th, 2013 at 9:18 pm and is filed under Uncategorized. You can follow any responses to this entry through the RSS 2.0 feed. You can leave a response, or trackback from your own site.